How to mend a broken heart? Cut it up and glue it to some cardstock! 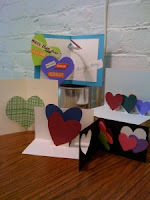 Join me on Saturday, February 6th from 2 to 4 for my Pop-up Valentine workshop at the Modern Spool studio. Nothing says "Don't you think I'm cool?" like a pop-up work of art. I hope you can join me! Here's a little paper cut I did just before the new year. I was inspired by a contrasty photograph of a butterfly I found in my uncle's artist morgue. I scanned it into Illustrator, increased the contrast, and printed it out for cutting. I mounted it on some translucent paper from discarded paper samples. I love reusing and recycling when I can. Sometimes beautiful paper comes through our mailboxes and heads straight out to the recycling bin. I like my butterfly, but I can see some rough places in my cutting. I think of this first try as an experiment. In the process of trying to do this detailed work, I discovered that I need new glasses. I'm looking forward to clear vision and more challenges in 2010!